Oil on canvas, 30 x 37 cm. In 1854-55, Skovgaard undertook his first longer Grand Tour to Italy. He was newlywed and his wife Georgia accompanied him. It was a trip they had looked forward to with longing. Both harboured great expectations for the encounter with intimate village communities, vast landscapes, cultural attractions and, not least, the grand Italian painting tradition. The trip went from Milan and Venice in the north to Rome and Naples in the south. 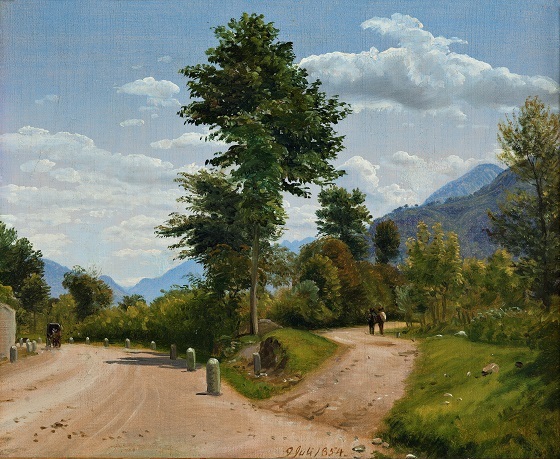 This painting of a country road in the wooded Sabine hills northeast of Rome indicates how widely Skovgaard travelled in order to study Italy’s landscapes, also to more remote and inaccessible regions. Here, he carried out numerous sketches and would often paint in front of the subject.